mammals are members of class Mammalia ( /məˈmeɪli.ə/), air-breathing vertebrate animals characterised by the possession of endothermy, hair, three middle ear bones, and mammary glands functional in mothers with young. Most mammals also possess sweat glands and specialised teeth. The largest group of mammals, the placentals, have a placenta which feeds the offspring during gestation. The mammalian brain, with its characteristic neocortex, regulates endothermic and circulatory systems, the latter featuring red blood cells lacking nuclei and a four-chambered heart. Mammals range in size from the 30–40 millimeter (1- to 1.5-inch) bumblebee bat to the 33-meter (108-foot) blue whale. The word "mammal" is modern, from the scientific name Mammalia coined by Carl Linnaeus in 1758, derived from the Latinmamma ("teat, pap"). All female mammals nurse their young with milk, which is secreted from special glands, the mammary glands. 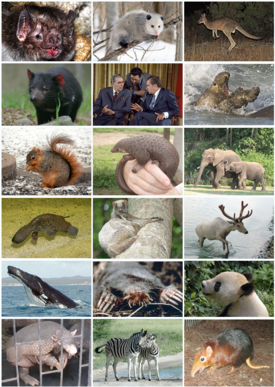 According to Mammal Species of the World, which is updated through periodic editions, 5,676 species were known in 2005. These were distributed in 1,229 genera, 153 families and 29 orders. In 2008 the IUCN completed a five-year, 17,000-scientist Global Mammal Assessment for its IUCN Red List, which counted 5488 accepted species at the end of that period. ]In some classifications, the class is divided into two subclasses (not counting fossils): the Prototheria (order of Monotremata) and the Theria, the latter composed of the infraclasses Metatheria and Eutheria. The marsupials are the crown group of the Metatheria and therefore include all living metatherians as well as many extinct ones; the placentals are likewise the crown group of the Eutheria. The classification of mammals between the relatively stable class and family levels has changed often; different treatments of subclass, infraclass and order appear in contemporaneous literature, especially for Marsupialia. Much recent change has reflected the results of cladistic analysis and molecular genetics. Results from molecular genetics, for example, have led to the adoption of new groups such as the Afrotheria and the abandonment of traditional groups such as the Insectivora. The early synapsid mammalian ancestors were sphenacodont pelycosaurs, a group that also included Dimetrodon. At the end of the Carboniferous period, this group diverged from the sauropsid line that led to today's reptiles and birds. Preceded by many diverse groups of non-mammalian synapsids (sometimes referred to as mammal-like reptiles), the first mammals appeared in the early Mesozoic era. The modern mammalian orders arose in the Paleogene and Neogene periods of the Cenozoic era.